Fumiya has been a university student for eight years, leads a lazy life and owes money to loan sharks. One day, a man named Fukuhara comes to collect the loan, which Fumiya cannot pay. So Fukuhara makes a proposition: he will cancel the debt as long as Fumiya agrees to walk with him across Tokyo to the police station of Kasumigaseki, where he intends to turn himself in for a crime he deeply regrets. Not having much choice, Fumiya accepts the deal. Thus begins their journey which will lead them to various unusual encounters, most of all with themselves. "With only five feature films to his credit thus far it seems a bit premature to say that Adrift In Tokyo is writer-director Miki Satoshi's masterpiece. He's got a lot more film left in him, after all, and who knows what he'll come up with next. But, by god, he's got a hard road ahead of him if he expects to top this one, a film that any director of any nationality would be proud to have on the resume." 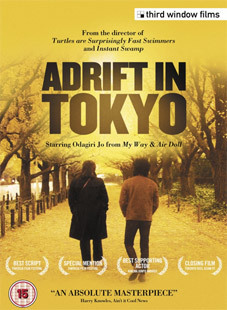 Adrift in Tokyo will be released on 27th February 2010 by Third Window Films at a to be confirmed RRP.